Join us for our weekly market that supports 60+ local vendors who sell a mixture of produce, plants, eggs, meats, cheeses, fresh baked goods, take home foods, ready to eat lunch bites and locally made handcrafts. Live music is booked to perform on the stage inside the park each Saturday. Dog friendly and free to attend. 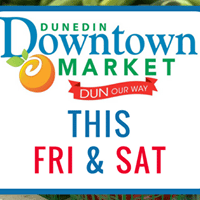 The Dunedin Downtown Market is open every Friday and Saturday! Friday market days end in May and Saturday Market days end in June.